YSS is the largest manufacturer of shock absorbers in the world, manufacturing over 2,000,000 per year. 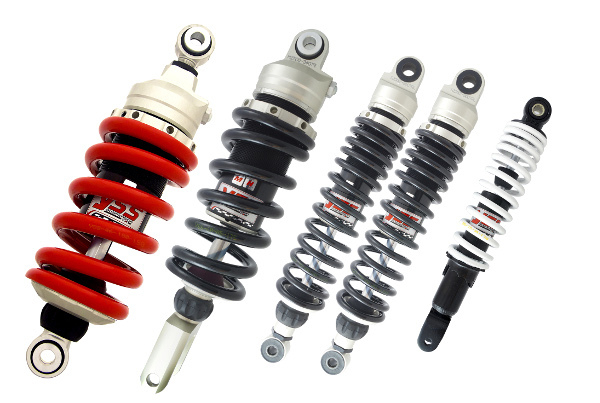 With over 30 years experience, YSS has become a brand trusted for producing high-quality motorcycle shocks. Available for a wide range of Honda, Yamaha, Suzuki, Kawasaki, Harley-Davidson, BMW and many more models; all without the shocking price tag. All YSS shock absorbers are designed, manufactured and tested at the YSS factory in Thailand, by a team of 270+ knowledgeable and innovative staff. Each shock is heat-treated to make it stronger and longer-lasting, and shot-peened for a professional finish. YSS has achieved TUV, KBA and ISO accreditation. Each shock comes with a full two-year warranty for added assurance. No matter what your budget, YSS has the shock for you. The full range is available from Wemoto, offering additional features such as threaded spring pre-load adjustment, high and low-speed compression adjustment and a 60 click rebound adjustment; depending on your taste and preferences. YSS Shock absorbers are engineered to the ideal specification for each bike and, as such, come ready to install straight out the box, without the need for any further adjustments.